Sharps Containers BUY Sharps Disposal, Waste Disposal by Mail, Sharps Containers, Sharps Mailback, 13000,13000008 Sharps Disposal by Mail. 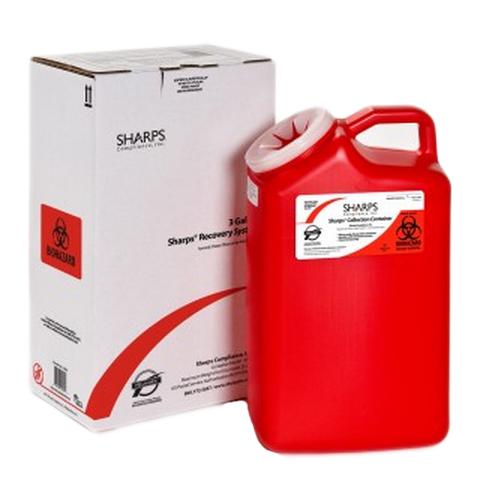 3-Gallon Sharps Recovery System is a complete mail back disposal system that simplifies the management of bio hazardous waste. Available for purchase individually or in a case of 8. The 3-gallon container is ideal for medical professional offices that produce larger numbers of sharps such as veterinarians or retail-pharmacies that provide in-house immunization programs. The Sharps Recovery System is approved for returns in all 50 states and US territories by USPS. Each system includes a red OSHA-compliant sharps collection container, return shipping box, tracking manifest, instructions for use, and pre-paid return shipping. When ready for return, simply place the red container in the pre-paid shipping return box and return to Sharps. Weight of each container: 3.5 lbs per container; 28 lbs per case; not counting the weight of the individual return boxes. Maximum Returnable Weight Capacity per container: 25 lbs.